Sure, there still exist some offroaders who are irresponsible (just as there are some irresponsible backpackers). However, the fact remains that most Jeep owners tend to use their 4×4 vehicles as a means to access, explore and appreciate the wonderful, remote, natural areas of the back country. And most are riding on the roads designated specifically for off-road use. This shift in attitude of today’s 4×4 drivers has had a tremendous impact on the public’s image of four-wheelers. This is due, in large part, to the many four-wheel drive clubs and organizations working together to educate their members… and the public. After all, if drivers don’t begin to drive more safely and take responsibility for their actions on and off the trails, the end result will likely be LESS off-road access for vehicles. Instead, the result could actually be MORE areas designated specifically for vehicles to ride off-road. While the threat of diminishing lands available for public use may never go away altogether, drivers certainly seem better educated on the facts today, and we continue to work together to make things get better, rather than worse. Educate yourself. Take it upon yourself to learn more. Aim to become more informed so that you can inform others. Share your knowledge of responsible use of our lands and resources with your children, your family, and your friends. Be proactive. Work with local groups, clubs, organizations in your area, and meet other individuals willing to enhance the image of four-wheelers with you. Adhere to the Tread Lightly principles set forth by the U.S. Forest Service — a set of common-sense rules for low-impact vehicle travel. Tread Lightly rules are now universally adopted by 4WD manufacturers, clubs and individuals involved with 4×4 off-road riding. Follow the Blue Ribbon Coalition’s Recreation Code of Ethics — a standard for preserving our natural resources forthe public, rather than fromthe public. Be responsible. If you use a vehicle of any kind to explore the back country, make sure you are a low-impact user who leaves the area better than you found it. Drive only on established roads and trails. Pick up trash if you see any. Travel quietly. And be courteous to other back country users whether they’re on foot, horseback, or in vehicles. Self-police. If you see someone violating the rules, don’t just sit back and watch, allowing it to happen. Instead, try to correct the problem as it’s happening. Unfortunately some environmental advocates still strive to damage the image of four-wheelers who love the sport of driving off-highway. Some try to depict 4×4 drivers as environmental vandals encroaching on life’s precious lands. They do this to justify their reasons for closing primitive roads and trails in areas of isolation and scenic beauty. 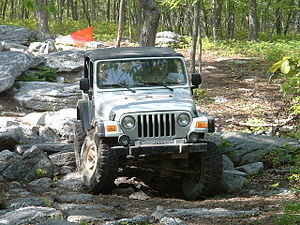 In reality, off-road back country explorers have a lot in common with the environmental groups! In fact, four-wheel drive clubs are frequently involved in environmental cleanup and conservation projects and work in collaboration with federal land management agencies. We must remember that the use of these remote and primitive roads by 4×4 drivers actually increases the traveler’s appreciation of the wilderness and has no real environmental impact when used within the guidelines set forth by federal agencies and other organizations.